We do most of our business by email. Feel free to drop us a line! We recommend a swatch before purchasing fabric. While we try very hard to accurately photograph our fabrics, please be aware that colors can vary from one computer system to another. All sales are final! 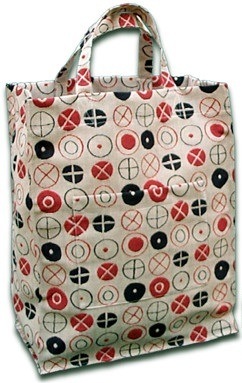 Large Gift/Tote bag in Classic Mid-Century Modern Eames "Circles" fabric! 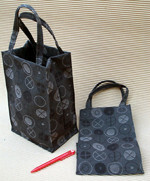 - 1 available - Hurry! We love mid-century modern fabrics and today's contemporary textile designs. We've been selling discount modern upholstery fabrics online for 10 years, with a selection of surplus and overstock fabrics from top names in the industry at 60% to 80% below retail! These overstocks/surplus fabrics range from pre-cut pieces to large yardage bolts. Best Values at the Lowest Prices! If you ever have any questions, please email us at: fabrics@winterbeachmodern.com, we'd like to hear from you! Click Here For Our Latest Upholstery Fabrics!